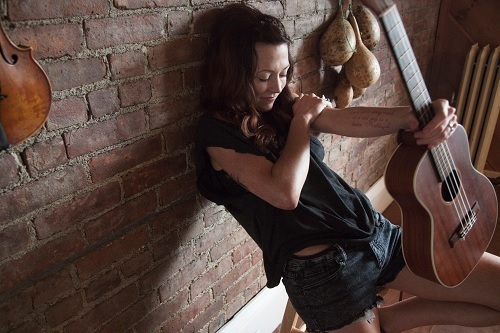 On Wednesday May 21st, Amanda Shires returns to WagonWheel Presents… at The Greystones. Back in the UK to promote latest album Down Fell The Doves, Amanda Shires is someone you simply can’t ignore. She has toured here with Rod Picott in the past but Amanda, voted Texas ‘Artist of the Year’ in 2011, now headlines tours in her own right and, boy, does she put on a show. Support comes in the form of an acoustic set from Big Convoy. Advance tickets priced at £9 are available from http://www.wegottickets.com/event/253084 or entry on the night will be £11. Doors open 7.30pm for an 8pm start. Just in case the title alone wasn’t a dead give away, Amanda Shires’ Down Fell the Doves is not a record for the faint of heart, faith or spirit. Not that anyone who heard her last album would have expected such. Carrying Lighting, the critically acclaimed 2011 breakthrough that put Shires on the map as one of Americana music’s most arresting new voices (and Texas Music magazine’s 2011 Artist of the Year), was a kudzu-tangled web of frayed heartstrings and combustible desire that revealed the one-time “little fiddle player from Lubbock” to be a grown woman unafraid to “get wrecked in love” and dish out the same with keen poetic insight and unnervingly mature, femme-fatale conviction. But as striking as Lightning was, Down Fell the Doves (Shires’ debut for Lightning Rod Records) is where the gloves really come off. “I wrote that one in a haze of delirious exhaustion,” she says of the song that imagines, amongst other possible exit strategies, the sweet surrender of “a rose-petaled, eyes-closed collapse” in a warm blood bath. She addresses that theme directly in arguably the album’s most gorgeously bittersweet track, “The Drop and Lift.” Elsewhere, it’s left to the listener to gleam whatever hope one can from the likes of “Box Cutters” and “Deep Dark Below” — a sombre meditation on the nature of evil (“Monsters are men that the devil gets in … it’s usually the weak ones he finds”). Ditto the equally unsettling, relationship-haunting demons stirred in “Devastate” and “If I” (the latter of which asks, with chilling frankness, “If I were to break a promise that I made … would you really want me to come clean?”). In the album-closing “The Garden (What A Mess),” a striking still life of an ill-fated love gone to seed, the titular doves drop “gray-eyed and flightless” like a hard rain of fallen angels, littering the ground like spoiled fruit and jagged shards of broken heart and innocence. Juxtaposing that at times overwhelmingly grim emotional terrain, though, are songs that deliver just enough light to keep the shadows themselves on edge. Noting that “all of the songs are reflective of what I’ve been doing the last two years,” Shires — who was married in early 2013 to fellow singer-songwriter Jason Isbell (with none other than Todd Snider conducting the nuptials) — coos unashamedly when asked about the tender-hearted “Stay.” “Oh, that’s a cute one,” she gushes playfully. “Pretty sappy, huh?” And then there’s the flirty but reverent “A Song for Leonard Cohen,” in which she fantasizes about “comparing mythologies” with her favorite songwriter over a drink or 12. She wrote the song the following day — and still keeps said tiger claw handy … just in case. “But I don’t need anybody testing it out or anything,” she says. When it came time to capture magic in the studio, though, the only good luck totems Shires relied upon were her trusty fiddle (and ukulele) and well over half a lifetime’s worth of firsthand playing and recording experience — augmented by the decades more brought by guitarist Isbell, bassist Jimbo Hart, drummer Chad Gamble and producer Andy LeMaster (Bright Eyes, R.E.M.). The album was recorded at LeMaster’s Chase Park Transduction studio in Athens, Ga.
“It’s a lonesome instrument,” marvels Shires, who picked up her first violin at age 10, played Western swing music all through her teens (with the legendary Texas Playboys, no less) and continues to find new and interesting sounds on the versatile instrument that surprise even her. “I like the ways you can make it sound like wind, or fire, or … like wild. And I like that it can also be pretty. 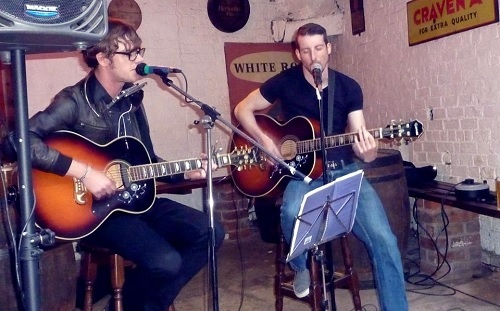 Tonight John & Mat perform an acoustic set.